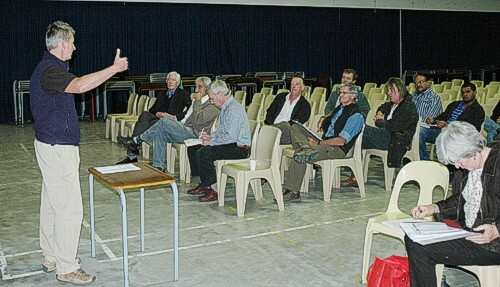 The Zandvlei Estuary Management Forum (ZEMF). 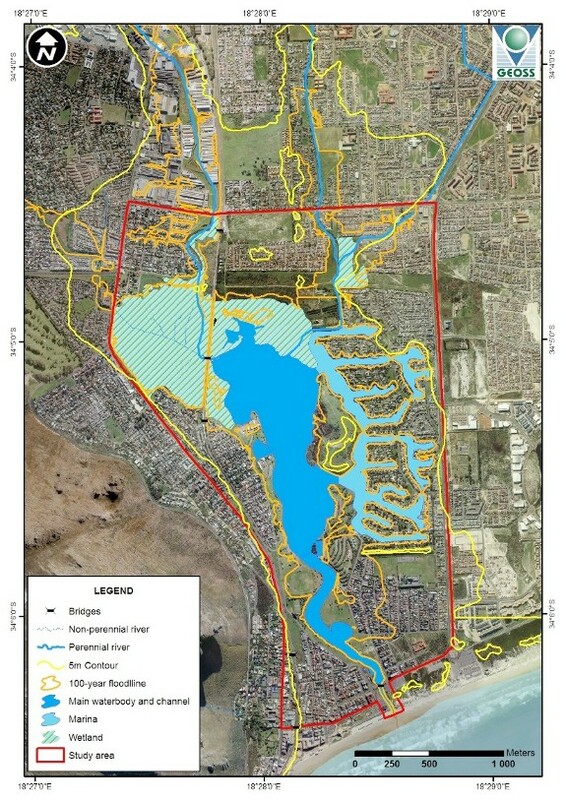 CAPE Estuaries Programme: Implementation of the Estuary Management Plan (EMP) for the Zandvlei Estuary, Muizenberg, Cape Town. NB. Please note that the Zandvlei Protected Areas Advisory Committee (ZPAAC) has superseded the function of ZEMF as of June 2015. This is an advisory group to the implementing agents of the Zandvlei Estuary Management Plan. Zandvlei looking south towards Simons Town. 20 May 18h00 Meeting and formation of the ZPAAC. 25 March 13h30 Status of the PAAC, ZEMF, Litter. The draft minutes of the meetings will be published here for all to read. These are for information only. The minutes will be accepted at the following meeting with or without the required amendments. 28 August 2013 ZEMF meeting minutes draft. 28 August 2013 ZEMF meeting agenda. 29 May 2013 ZEMF meeting agenda. -. 27 February 2013 ZEMF meeting minutes draft. ZEMF meeting agenda and photos. 03 October 2012 ZEMF meeting minutes draft. 25 June 2012 ZEMF meeting minutes draft. 24 April 2012 ZEMF initial meeting minutes draft. Public open meetings were held in February and March 2012 for stakeholder groups to follow the information process. Formal nominations were called for from the various organisations of civil society. The first meeting of the Forum took place at Muizenberg High School Hall on 24th April 2012 Sandra Fowkes was nominated and elected Chairman. The process was facilitated by Lynn Jackson (Coastal & Environmental Consulting). Pierre de Villiers indicating we have all agreed to and elected the inaugural Chairman. April 2012 Read the Consitution. updated. The Plan was developed by a process facilitated by Lynn Jackson (Coastal & Environmental Consulting). This took place in 2010, with input by the stakeholder groups. April 2012 Read about its development. updated. December 2010 Read the Plan. updated. April 2012 See the map of the Zandvlei Estuary Reserve. updated. These three TWG's Pondweed Management, Hydrodynamics and Water Quality and Fishing were regarded as the most imortant issues for the Forum members to start and address. There is no limit to the number of different TWG's, as long as they are pragmatic and contribute to the solutions which are required. When the various additional TWG meet, the names and minutes of the meetings will be published below. Additional individuals with expertise may be co-opted, so the names can change from time to time, depending on the issue and its requirements to be solved or addressed. 18 March 2014 Fish Hoek Echo newspaper report on Pondweed. updated. Pondweed presentation by Dr David Walker. 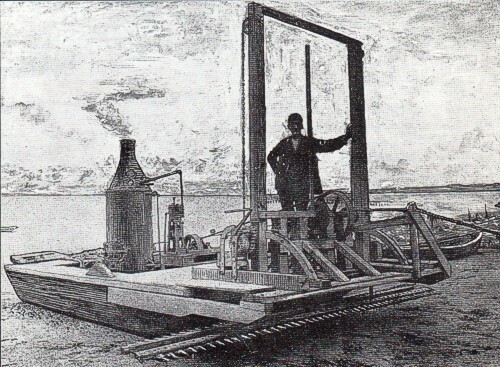 A steam powered waterweed harvester from the 1890's in USA. 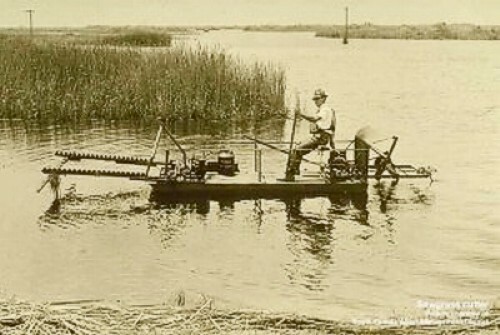 The true origins of the harvesting industry began with a weed cutter boat built by the Hockney Company in Silver Lake, Wisconsin, in 1903. It is interesting to note that this machine was not originally built to meet recreational purposes; it was made in response to fussy Chicago housewives! Around the turn of the century, ice was harvested from Wisconsin lakes destined for Chicago iceboxes. The housewives there didn’t like cleaning out the weeds when the ice melted. Hockney designed this small boat, which featured a reciprocating cutter bar and duck-feet-like paddles for propulsion, to cut down the weeds in the fall so that clean ice could be harvested in the winter. 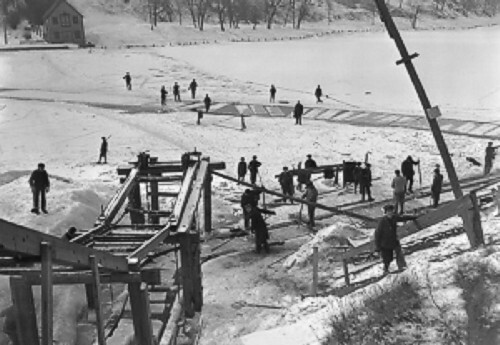 Ice being harvested from Wisconsin lakes for Chicago iceboxes in the early 1900's. 2. Hydrodynamics and Water Quality. Vincent Marincowitz handing over a secchi disc for use by ZEMF members in October 2012. 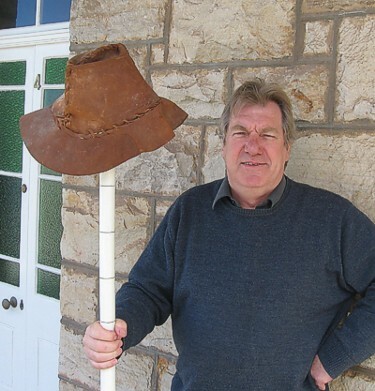 He made it for Zandvlei Trust members use and has been a hat stand for some years. A secchi disc is used for measuring turbity of a waterbody. Update 09/03/2013 - Yvonne Bulgen is now using the secchi disc when taking readings in the vlei. Hydrodynamics and Water Quality Meeting Minutes. 11 Nov 2013 Report of the workshop on the silting of the estuary mouth area. updated. 26 June 2013 The observed silting up of the Zandvlei estuary 2002 - 2011. updated. 28 Aug 2012 Nutient dynamics in Zandvlei. updated. 4. Economic value of the Zandvlei Estuary. 15 January 2013 The economic relevance of the Zandvlei estuary - draft document. 5. Documents released for the administration control purpose. rubble weir is 0.4m above * M.S.L. CAPE TOWN BENEFITS FROM MULTI-AGENCY COOPERATION IN MARINE AND ENVIRONMENTAL LAW ENFORCEMENT AND LAUNCHES THE CITY OF CAPE TOWNS SPECIALISED MARINE AND ENVIRONMENTAL LAW ENFORCEMENT UNIT. 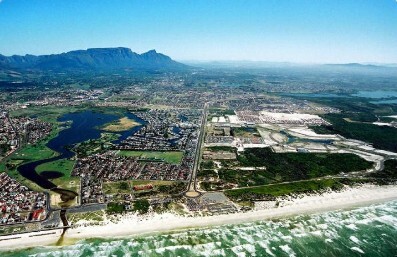 The City of Cape Town has over 300km’s of coastline, one of its greatest economic, social and environmental assets. Although the City’s jurisdiction is determined by the high-water mark, economic, recreational, environmental and illegal activities operate across these jurisdictional boundaries. The inshore marine and coastal environment including the adjacent terrestrial environment is a central component to Cape Town offering many positive opportunities and attributes. Unfortunately, the trend of illegal activities and the lack of adherence to our country’s laws and City’s by-laws are impacting negatively on the marine and coastal environment and have strong relationships with organised crime and the drug trade within Cape Town with a subsequent negative impact on residents, local livelihood opportunities and the ecotourism potential of our city. Loss of recreational areas for the general public due to criminal activity and related safety concerns. Lawlessness across the spectrum from minor offences to serious offences being considered the societal norm with little or no consequences. Poor public perception of the authorities’ ability to regulate and manage society in an equitable and fair manner. 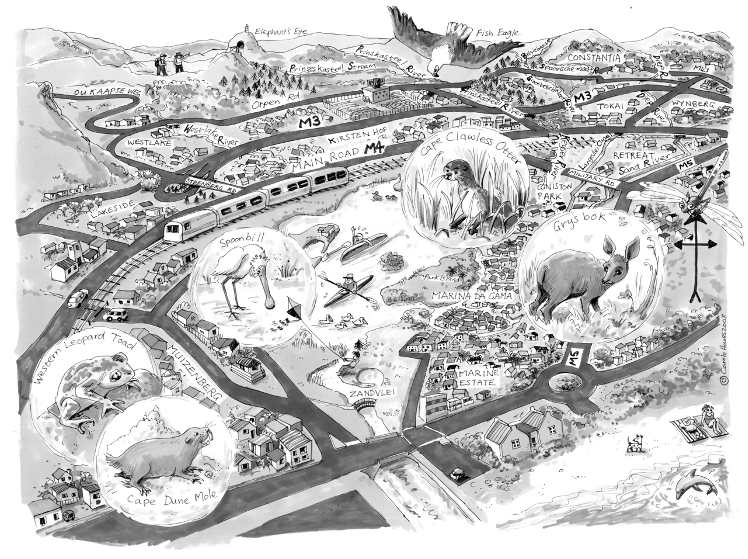 Natural resource depletion, through unsustainable practices, impacting on economic and employment sustainability, including the adjacent terrestrial biodiversity areas that are also under severe pressure from illegal harvesting with over 300 species, at an estimated 216 000kg/yr, being illegally harvested out off Cape Town’s natural areas. The Department of Agriculture, Forestry and Fisheries (DAFF) has an active programme in supporting municipalities to become operationally effective in the near inshore marine and coastal environment within municipal boundaries in order that they may support DAFF’s law enforcement and compliance efforts. Cape Town stands to be one of the first beneficiaries of this unique and new approach by DAFF. This in conjunction with the City of Cape Town prioritising law enforcement and compliance as one of the key strategies to create the Opportunity City, the Safe City, the Caring City, the Inclusive City and the Well-run City has resulted in a new partnership between the City and a number of other law enforcement agencies. Following a two day workshop held in June of 2012, convened in partnership between the Department Agriculture Forestry and Fisheries (DAFF) and the City of Cape Town, it was agreed and recognised that a proactive multi-agency collaboration was needed to further address marine law enforcement. This workshop resolved that considering illegal activities, economies, safety and ecology took place across jurisdictional boundaries, the most appropriate means of effective policing and enforcement was through a collaborative Cape Town Marine and Coastal Law Enforcement and Compliance Task Team. The task team is chaired and led by DAFF and is tasked with multi-agency action, shared information and collective outcomes in the best interests of all of our citizens. The Task Team was officially established in September 2012 and comprises representatives from the Department Agriculture Forestry and Fisheries, City of Cape Town Marine and Environmental Law Enforcement Unit, SAPS Borderline Police, Table Mountain National Park Marine Unit, SARS Customs, the National Prosecuting Authority, the Department of Environmental Affairs, CapeNature Conservation and the South African Maritime Safety Association (SAMSA). These are all the agencies responsible for marine and coastal law enforcement, management and regulation. The objective of Task team is to develop and implement a Cooperative Marine and Coastal Compliance and Law Enforcement strategy for the coastal zone within the City of Cape Town Metropole. As a measure of its commitment to this partnership and role Mayoral Committee Member for Safety and Security, Alderman J.P Smith has provided his support and approval for the development of a City of Cape Town Marine and Environmental Law Enforcement Strategy and an associated specialised Marine and Environmental Law Enforcement Unit to work directly with this new Task Team. The new specialised and dedicated Marine and Environmental Law Enforcement Unit falls within the City’s law enforcement structures. The Department Agriculture Forestry and Fisheries have been supporting the City in this initiative, including the appointment of City Law Enforcement staff as Fisheries Control Officers in terms of the Marine Living Resources Act. The members of the unit have received specialised training in many aspects of marine and environmental law enforcement. They are also all fully qualified and trained lifeguards. The Unit will work across the City in response to needs and addressing hotspots of illegal activity and non-compliance, as well as dealing with safety and security at the City’s beaches and coastal resorts. They will provide support to the all the agencies along the City’s coastline and act as a force multiplier when required. They will also be conducting regular inshore boat patrols on the City’s newly acquired law enforcement vessel. All partners agreed that key to this partnership was regular and on-going joint operations with an increased visible presence along the coastline. This commitment was realised with the first of what will be many joint operations conducted from the 15th to the 18th November 2012. The operation was conducted under the operational command of DAFF and the SAPS Borderline Police, together with the City of Cape Town Marine and Environmental Unit, SARS Customs and the Table Mountain National Park Marine Unit and proved to be highly effective. The unit has already achieved considerable success through increased visible policing in the coastal zone, stringent enforcing of the City’s by-laws and the Marine Living Resources Act. The unit has also assisted DAFF and SAPS in regulating control at the slipways along the City’s coastline. Moving into the future the City will build on the current partnerships and inter-agency cooperation that has been established and will also be focussing on awareness around the Marine and Coastal environment and regulations. CITY OF CAPE TOWN - 11 MAY 2012 - MEDIA RELEASE. Public warned of presence of Blue-Green Algae in Zandvlei Marina canals. The City of Cape Town would like to alert residents to the presence of a Blue-Green algal bloom in the Marina canals at the Zandvlei Estuary Nature Reserve. The Zandvlei Estuary Nature Reserve experienced various problems over the past few weeks which included, amongst others, a bloom of Golden Algae and fish deaths. The most recent analytical results from the City’s Scientific Services laboratory (25 April 2012) showed a decline in the extent of the Golden Algae bloom. Although the algae is still present, it does not appear to have caused further fish to die off. The Biodiversity Management Branch of the City’s Environmental Resource Management Department is undertaking regular inspections several times a week at a number of locations in both the Marina Da Gama and main vlei area. These inspections have shown improvement in water clarity. The sand prawns are active indicating that the golden algae bloom did not impact these organisms. However, in the last day or so there has been a visible green colour in some of the blind-ending Marina Da Gama canals. It has been established that this is as a result of various species of Blue-Green Algae (Cyanophyceae). The occurrence of these species is of concern, because they can produce toxins. Eight samples were collected from various locations around the estuary (mainly the Marina canals and the outlet channel) on 10 May 2012, and analysed to test for the presence of toxins. No toxins were detected in the samples. Although the algal bloom is not toxic, people and their pets should not drink from or swim in the Marina canals as an extra precautionary measure. Canoeing, sailing and other non-contact recreation sports are fine and the estuary therefore remains safe for these recreational activities. Blue-Green Algae bloom in response to nutrients and warm, still conditions. Residents are asked to assist the City by reporting any increases in the extent of the bloom or any other unusual conditions that they observe. The succession of blooms from the Golden Algae to Blue-Green Algae not surprising, as nutrients are being recycled from one species to the next as the blooms wax and wane. The City will continue to monitor the situation very carefully. Although the Marina Da Gama canals are a concern, the rest of the vlei and the mouth is recovering from the recent Golden Algae bloom. At this stage the mouth will probably remain open for the duration of winter, in accordance with the Mouth Management Protocol. The pondweed harvesting was halted to assist the vlei in its recovery. However, loose weed broken during winter storms and from previously cut pondweed, is at present being removed. The Zandvlei Estuary Management Forum’s pondweed task team will discuss the way forward regarding harvesting within the week. Zandvlei is Cape Town’s last effectively functioning estuary and supports at least 23 species of indigenous fish. Estuaries are particularly important as nurseries for many marine fish species and, as such, Zandvlei not only supports recreational fishing but acts as a haven for fish stocks targeted by small-scale commercial fishers in the adjacent marine environment. Zandvlei is one of the City’s 16 official nature reserves. Issued by: Communication Department, City of Cape Town.